At the time of the inauguration, Abraham and Mary Lincoln had been married for 18 years. Lincoln described them as “the long and the short of it.” He was six foot four; she was five foot four. He never completely shed his frontier upbringing. She was raised in a world of manners and could be very formal. Each was extremely moody. He was often withdrawn; she could be explosive. Both were ambitious and devoted to each other and their family. The Lincolns moved into the White House with two small boys, William Wallace (Willie), age 10, and Thomas (Tad), age 7. Their oldest son, Robert Todd, age 17, was attending college at Harvard and later joined the army. 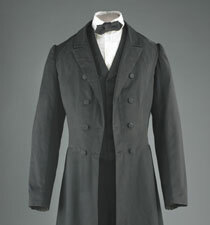 Abraham Lincoln wore this black broadcloth coat, vest, and trousers, as his office suit during his presidency. The shirt and tie are reproductions. 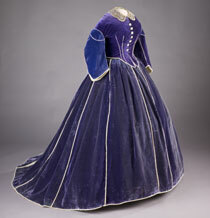 Mary Lincoln’s purple velvet skirt and daytime bodice are believed to have been made by African American dressmaker Elizabeth Keckly. The first lady wore the gown during the Washington winter social season in 1861–62. Both pieces are piped with white satin, and the bodice is trimmed with mother-of pearl buttons. An evening bodice was included with the ensemble. The lace collar is of the period, but not original to the dress. After Abraham Lincoln’s death, Mary went into mourning and remained in widow’s clothes until her own death in 1882. She gave some of her White House finery to family members. Her cousin, Elizabeth Todd Grimsley, received this purple velvet ensemble. In 1916 Grimsley’s son, John, sold the ensemble to Mrs. Julian James for the Smithsonian’s new First Ladies Collection. John Grimsley attributed this dress to a “seamstress of exceptional ability” who “made nearly all of Mrs. Lincoln’s gowns.” Although he mistook her name as “Ann,” he most likely was referring to Elizabeth Keckly. 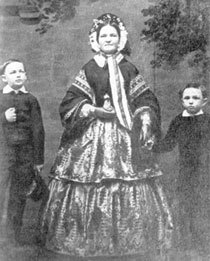 Mary Lincoln with Willie (left) and Tad (right), taken at the Preston Butler studio, Springfield, Illinois, November 1860. 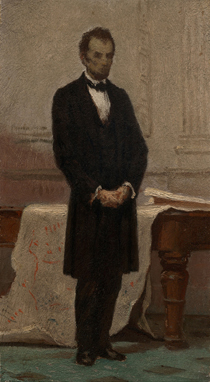 Lincoln’s office suit was used in a preliminary study for a posthumous portrait by Boston artist William Morris Hunt. In May 1865 Mary Lincoln sent Thomas Pendel, the White House doorkeeper, to deliver the suit. Pendel, being about the same size as Lincoln, posed in the clothing for the artist. Hunt kept the suit, and in 1894 his widow donated the clothing to the Smithsonian. The portrait was destroyed in a fire. Only Hunt’s sketch, done at the time, still survives. In chilly weather, Lincoln often wore a dark wool shawl over his shoulders. 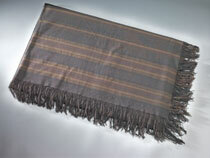 Many years later Robert Todd Lincoln gave his father’s shawl to his own friend, Washington attorney Frederick Harvey.